I have often come across magazine ads of sweets shop Ginza Cozy Corner advertising Disney themed cupcakes, and it was not until today that I was able to get a personal experience of these seasonal treats. 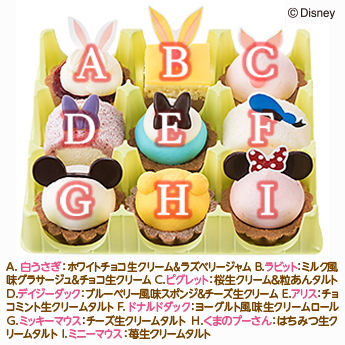 Ginza Cozy Corner caters to Disney fans with their character themed petite cupcakes. Made to be a bite-sized treat, the small cupcakes and tarts are exquisitely made, pleasing to both the eyes and the tastebuds without being overly sweet. A set of 9 comes at a price of 2100yen (about $20 USD). 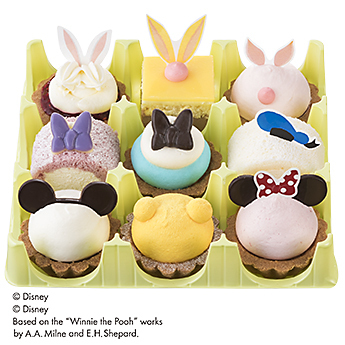 From March 4th, you can purchase the Easter themed Disney petite pastries collection. Each cupcake has a particular flavour and texture so every bite is a wonderful surprise. It’s a real treat to munch on during that Shinkansen ride!